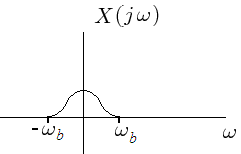 The function x(t) is sampled at times t = kT. The sampled function y(t) can be represented as the product of x(t) and a sampling function p(t). Combining equations 1 and 2. Since p(t) is a periodic function it can be represented by the Fourier series shown in equation 4.
where for impulse sampling, ak = 1 / T.
Multiplying equation 5 by x(t). Applying equation 7 to equation 6 results in the following for the frequency spectrum of y(t) the sampled signal. Consider a signal with the spectrum X(jw), of the baseband x(t). The spectrum of the sampled function, Y(jw), contains duplicates of the baseband signal shifted to multiples of kws , as shown below. This result, that the sampling frequency must be at least twice the largest baseband frequency is called the Sampling Theorem.